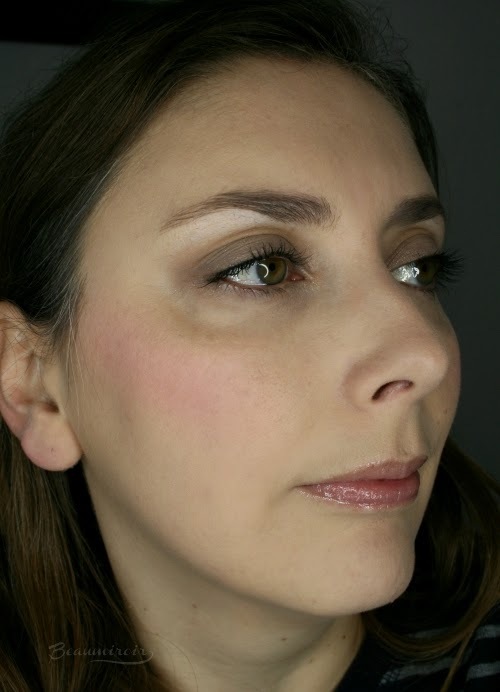 As spring is (finally) fast approaching, I want to show you my pick for fresh, just-pinched cheeks on this #FrenchFriday: Dior's intriguing color-adjusting Rosy Glow, described as a "healthy glow awakening blush". 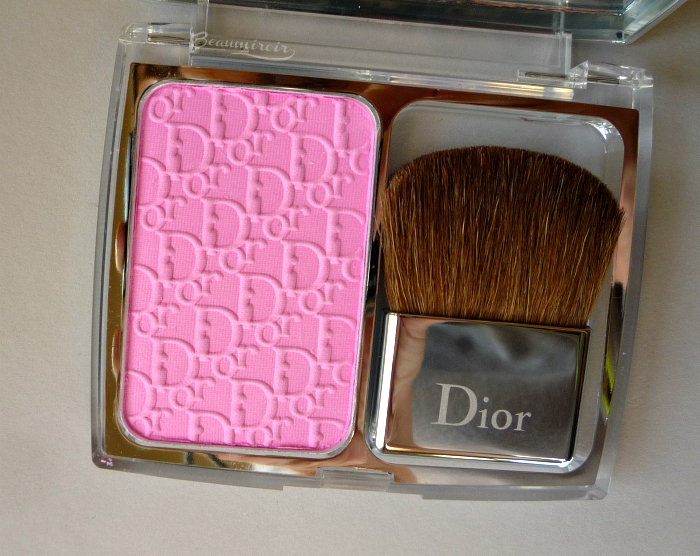 It's been around for years and Dior makeup artists have used it on me a few times, but I only just bought it a few months ago and it's now time to share my thoughts with you! 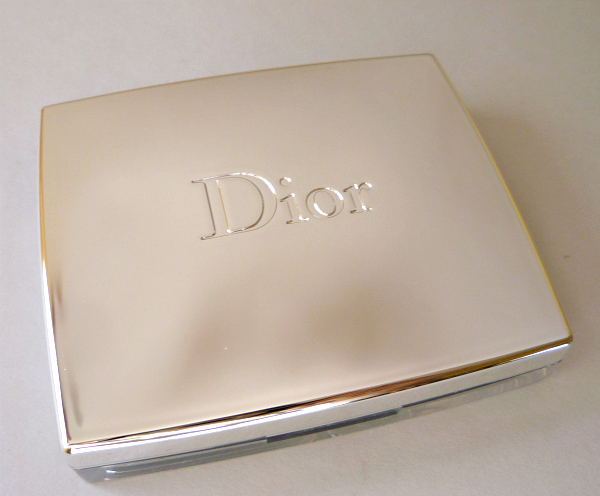 Dior Rosy Glow comes in a clear and silver compact that is classy and very sturdy, but also rather large compared to the size of the blush pan itself: it's the exact same size as the brand's 5-color eyeshadow palettes' compact. The extra space is reserved for a flat brush that, despite its small size, happens to be very soft and works perfectly well to apply this blush. It's pretty rare for a brush coming with a makeup product, even high-end, to be this good! Rosy Glow comes in one shade called 001 Pétale: in its pan, the color looks like a rather scarily bright light pink, bordering neon. That's really, and I mean really, not the kind of color I would wear on my cheeks. But it's not at all what it looks like once applied to the skin! I've tried other color-adjusting blushes before but I wasn't very impressed by the result. Rosy Glow, on the other hand, really delivers on its promises. Here's how Dior describes the effect: "[it] features the new Fresh Color Reveal technology which intuitively adjusts to the moisture of each skin to make the skin blush with delight. Upon application, Rosy Glow reveals fesh and luminous color that develops a rosy radiance to match each skin tone for an all-day, ultra-natural, customized and healthy glow effect." It's pretty fun to experience: when you first apply the blush, it looks rather weakly pigmented and you see a barely there pink veil. Within a few minutes, the color intensifies, becoming both brighter and darker. On me, it turns into a luminous warm, peachy rose (every single blush on earth looks warm on my skin) that is very close to the color of my skin when I blush. It looks very natural, as if I had just pinched my cheeks. I found it interesting that this formula reacts to moisture, according to the official description, and not pH as other self-adjusting makeup I've tried before. Knowing that, I will be careful to keep the compact out of my bathroom. Who knows what a perpetually humid environment could do to the pigment! I also noticed that testers in stores are often almost white, as if they had been bleached. Whatever the "Fresh Color Reveal" technology is, it's real: the pigment really changes color! The downside of this unique color-adjusting effect is that it makes application a little tricky. It's not really hard, but there's a learning curve. Basically, you have to apply less product than you think you need. Remember that what you see as you apply is much lighter than what it will look like after 5 minutes! I ended up with bright pink cheekbones like a Victorian porcelain doll a few times because my natural instinct pushed me to try building the intensity. 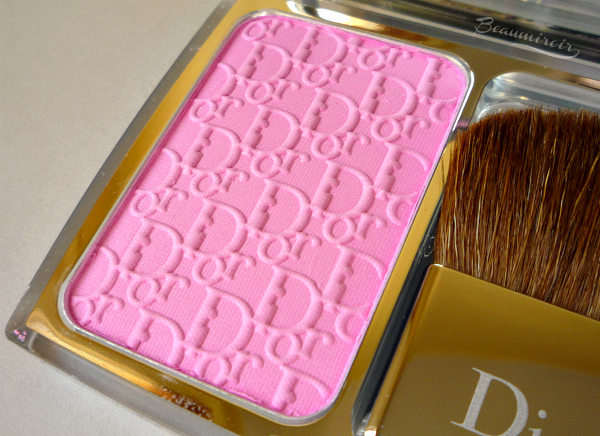 Dior suggests tapping the brush on the blush once, then sweeping on the cheeks, and I agree that it's enough color. If you want a bold cheek, tap twice, but not more. When in doubt, wait 5 minutes to see how intense it gets before adding another layer. The texture of Rosy Glow is very fine and soft, and did I mention that it smells like roses? The scent is subtle and I can't smell it after application. Despite being so smooth, I find that it's not the most blendable: having to "blind blend" before the color adjusts is probably what confuses me. The good news is that the blush lasts all day long with only minimum fading, and it stays even more fresh and intense on top of a liquid or cream foundation. 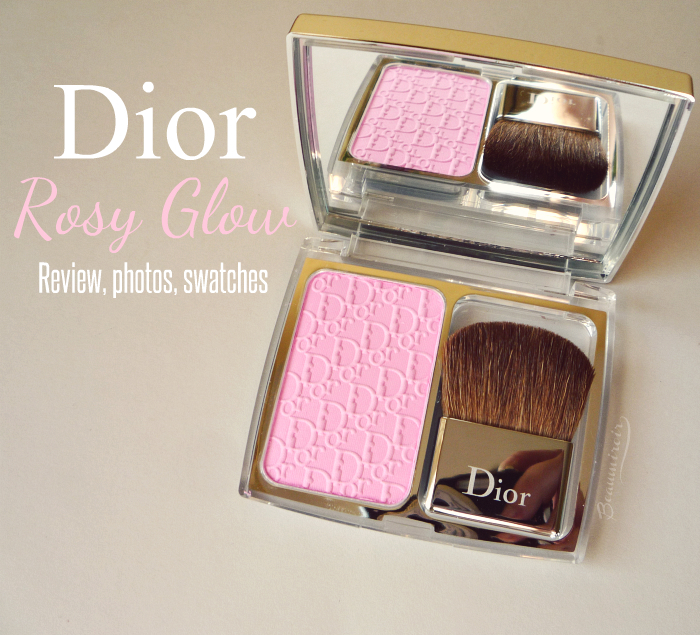 Dior Rosy Glow is a very unique product: I don't think you can buy any other color-adjusting makeup at the department store. The effect is really visible and every user will see a different, personalized color develop on their cheek! I love how it looks on me, it's the perfect natural flush for everyday looks. It is pricey, but considering how little you need, the pan should last forever.